Rainbow Loom, a two part solo exhibition by Suzanne Anker (BFA FA Chair and AP Faculty), curated by Renyi Hu (MFA AP13) opens on October 9 at SNAP and October 11 at V Art Center in Shanghai, China. Hu Renyi (AP 13) is in a group show at the V Art Center in Shanghai. “War of the Worlds,” an exhibition of work by Art Practice Alumnus Hu Renyi (MFA AP13) opens at V Art Center in Shanghai China on November 16. The installation “The War of The Worlds” by Hu Renyi, resonates with the sensibility of the two literary works in the Western tradition. One is 20th century American and one is 6th Century Greek. Orson Wells’ “War of the Worlds” is a radio play first performed live in the “Mercury Theatre on the Air,” in New York City. More familiar in world literature, “Allegory of the Cave” is a philosophical treatise written by Plato to challenge students at the academy where he taught. Each of these works of literature shows us how ignorance and rigid beliefs about human behavior can cloud our perceptions and lead to inadequate or disastrous adaptations to an evolving world. Renyi half fills the gallery wall with hand-sized flat black protozoa shapes that appear to be climbing the walls, perhaps losing their hold and falling back to earth. These two dimensional graphic shadows are interrupted by cool LED lights that appear to glow from the ambiguous organic figures. One very large shape dominates the lower half of the frame appearing to be moving upwards, potentially engulfing the viewer with darkness. 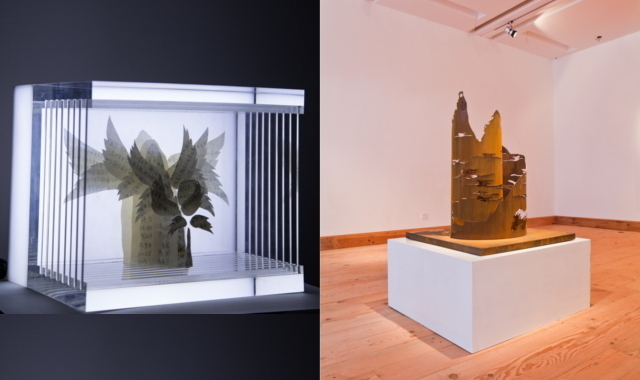 Renyi Hu (MFA AP13) is interviewed by ARTINFO about his recent sculptures and installations. Image: Renyi Hu’s “Artificial Function"
Photos from Renyi Hu’s (MFA AP13) exhibition in Beijing.